Holiday calls for cookie baking, of course! Besides the favourite classics like shortbread and gingerbread, I also like baking something different to add to the mix for more variety. The sablé Breton is one of my favourite cookies, it is the perfect cookie with some tea or coffee, when I am just craving something simple. 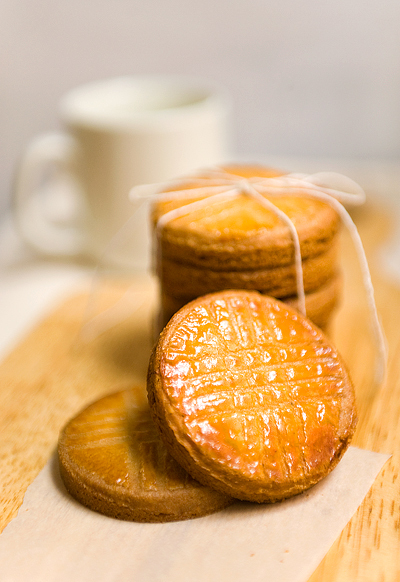 Sablé Breton is a French shortbread-like cookie orginated from the Brittany region. It is known for its rich flavour and its crumbly texture. The criss-cross pattern give the cookies their signature look. There are many different recipes of this cookie, but usually consisting of several simple ingredients: butter, sugar, flour, eggs, and sometimes almond flour. The recipe I am sharing here uses a good-quality European style cultured butter, pastry flour, and almond flour. 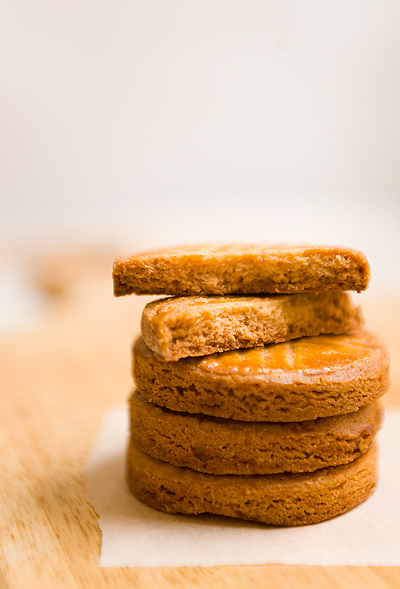 The combination of these ingredients give these sablés a buttery, nutty flavour and tender texture. Note on butters: most butters in North America have a fat content of about 80% while the ones labled “European style” have about 82-84%, and are usually cultured. The taste of these cookies greatly depend on the quality of the butter, using a butter with higher fat percentage will result in a more crumbly, sandy cookie, if it is also cultured, they will lend a deeper buttery flavour to the cookies. If you are baking shortbreads or cookies where the butter is a large portion of the recipe, definitely try using a higher quality butter, you will notice a difference! Serving Size: Makes about 12 cookies. This is a small recipe, you can choose to make the dough by hand with a spatula or make it with an electric mixer. Sieve together flour, baking powder, add in almond flour and mix with a fork. In a bowl, cream butter until soft and creamy. Add icing sugar and fold, mix until it becomes almost whipped, colour turing pale. In a separate small bowl, mix salt into egg. Add egg in about 3 additions to the butter mixture, mixing thoroughly after each addtion. Add flour and almond mixture all at once. Mix until there is no longer dry flour. Wrap dough in plastic, flatten into a disc and chill in the fridge for at least 40 minutes before rolling out. Take out chilled dough and place on a lightly floured surface. Using a rolling pin, rotating the dough, flouring more if necessary, roll the dough into a thickness of about 1 cm. Cut dough with a 6 cm round cutter, place on cookie sheet, continue with the rest of the dough. 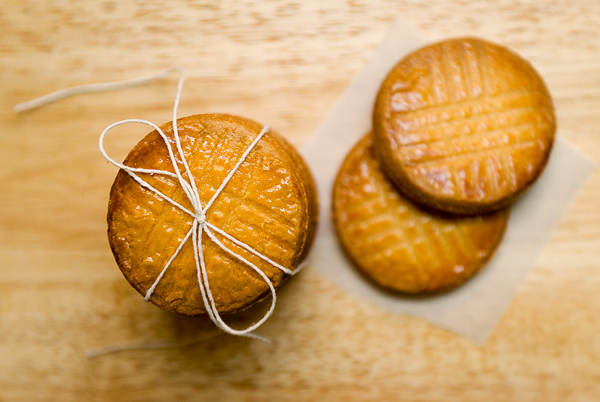 Lightly brush cookies with egg wash. To create the classic sablé Breton look, drag a fork across the middle of the cookie, using pressure to create the impression. Repeat on the cookie again, this time dragging the fork across forming a 90 degree angle. Finish the rest of the cookies. OPTIONAL: Lightly butter the insdies of 6.5 cm baking rings (slightly larger than the cookies), place rings on the garnished cookies. Bake for about 35 minutes, until the height of the cookies are uniform and the colour has turned evenly golden brown. Baking rings are optional, but will give the cookies a clean, round look. Feel free to cut the cookies to any size or shape you want, this recipe demonstrates the method to creating the classic look of these French cookies. I especially enjoy the crumbly texture and nutty flavour of these cookies, what sets them apart from the shortbread is the richness of the egg in there. The simple and elegant look also make these great of gift giving. Since the cookies are quite dry, they can easily keep for 1-2 weeks in an air tight container. Enjoy! I love that they are so simple and delicious!